live in the Eternal City; 180.000 in the houses and 120.000 in the streets. 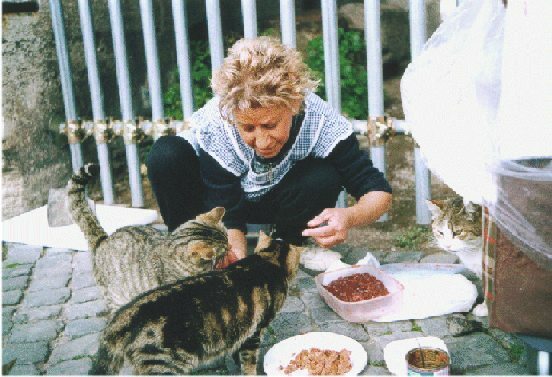 The latest animal census was commissioned by the Office for Animal Rights of the capital, and counted more than 4.000 colonies of cats. Cats are omnipresent in Rome; they can rightly be considered citizens and a symbol of the Eternal City. They are so popular that a regional law states that a group of more than 5 cats in the natural urban habitat constitutes a protected feline colony. There the animals are entitled to food, shelter and protection, and cannot be evicted. In exchange, cats have to accept hygienic rules and ... sterilization. This latter measure should keep the feline population under control, so that it can thrive. 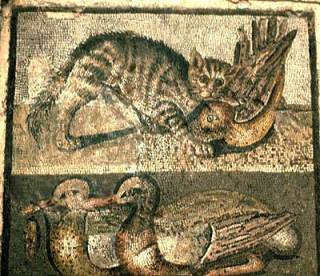 Romans generally love cats, because they are graceful, harmless, clean and keep the rats at bay, but they are not always welcome and there are some criminals (now it is a crime) who poison or beat them. 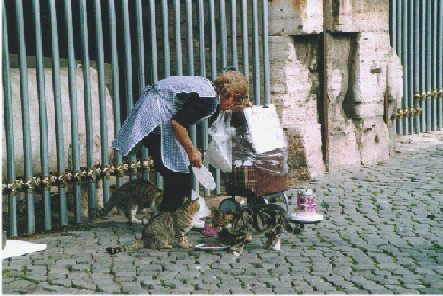 In Rome there are thousands of people who voluntarily feed, provide medical care and sterilize cats. Once they used to be mainly women (so-called "gattare"), but now both sexes are represented. Some of them have created an association, the ARCA, that counts 1000 members. See this site for an example. 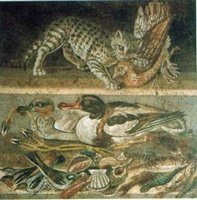 About 200 cats live in the Colosseum. They are rather happy and healthy. 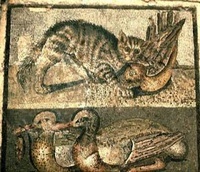 One of the gattare who feed and pamper them appears in the pictures on the right. She is a shy lady who knows all of her friends by name. As you can see the cats not only receive canned food, but also fresh liver and meat, and lots of loving care.